Last week, I had the privilege of attending the media day festivities for the 2012 Canadian International Autoshow. Happily observing the auto show as an assignment for Automoblog.net, there was more than one instance where motorsports interests were stoked at the Toronto exhibition. Part of an exciting display of new production and concept-based Honda vehicles was the all-new Dallara Indy car. A show car representing the final shape for the new Dallara DW12 chassis open wheel fighter, this race vehicle will deliver a technological step forward for the IZOD INDYCAR Series. Powered by a choice of twin-turbocharged, 2.4 liter V-6 powerplants from Chevrolet, Lotus and (of course) Honda, the latest Dallara chassis/engine combination more technologically-advanced than the normally-aspirated V-8 engine formula existing in the series since 1997. 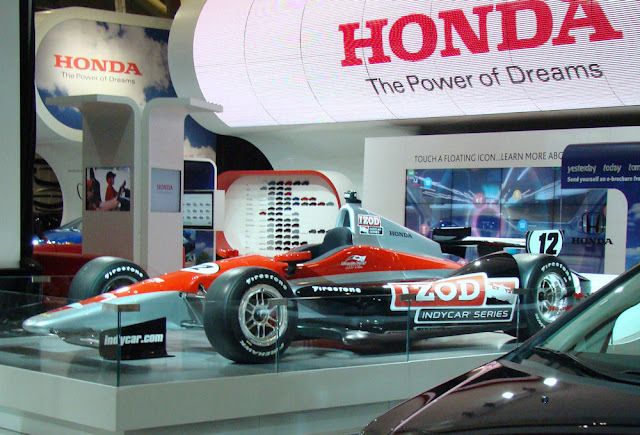 Despite being a newer, more competitive package, the 2012 Indy car engineered to be less expensive for teams to operate while offering improved safety and drivability. Built around a carbon fiber monocoque, the new Dallara Indy car can wear a multitude of varying body kits the leaque hopes to rolls out starting in the 2013 season. Keen followers to the progress of the Indy car will notice some minor differences from the mid-2011 show car. Witnessing the concept version of the 2012 Dallara at the 2011 Honda Indy Toronto in road course trim, the present design referred to a vehicle yet to be formally track-tested. While the oval version of the refined 2012 Dallara Indy car is not an exact comparison of the advancements made thanks heavily to the test driving of late Indy 500 champion Dan Wheldon, there are some elements that stick-out as altered. The final vehicle featured at the 2012 Canadian International Auto Show withdrew the Dallara's engine cover shark fin and is overall composed of less stylized body lines. The more polished piece displayed at Toronto also carried another more symbolic detail. Honouring the life and achievements of the 2012 car's test driver Dan Wheldon, the Dallara chassis wears the designating initials 'DW' as a continuing tribute. Set to premiere on the St Petersburg street course on March 25th opening the 2012 IZOD INDYCAR Series sechedule, many opern wheel fans in North Ameica will be eager to see the Dallara DW12 live up to the highest of potential.